The series is expected to launch in 2020. 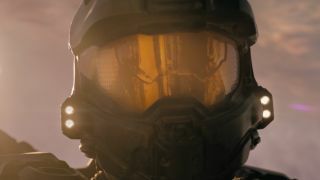 Master Chief will be a main character in the upcoming Halo TV series on Showtime, it was revealed yesterday. As reported by Deadline (who call Master Chief a 'muscular astronaut', which made me chuckle), the show, which is targeted for a 2020 release, will offer "a new story". The network is collaborating with series guardians 343 Industries to avoid any canon-based snafus. "It is an enormous undertaking," says Showtime's network president of programming Gary Levine, speaking at the Television Critics Association press tour. Deadline's report says the show will be filmed on studio backlots. The Halo series has a showrunner already: Kyle Killen, known for well-received big network shows that were cancelled too soon, like Lone Star, Awake and Mind Games. He appears to have been hired for a very specific reason. "We made a conscious decision to hire a writer not known for sci-fi or big battle movies. We want to make sure we get the inside human drama." Getting the scripts right will surely be a big challenge. Halo's stories have never really made me feel anything, except sheer horror at the end of Combat Evolved when Cortana confirms that every survivor from the Pillar of Autumn is dead (well, maybe not everyone). I love Halo's iconography, though, and if Showtime wants to spend a bunch of money bringing it to live action, that suits me just fine. It's the sort of big-budget genre project that's likely to stand out in this overcrowded age of peak TV. They better get Marty O'Donnell to do the music, though.